The image above is a wonderful glimpse into the history of a street which so many of us, Sydneysiders and visitors alike, are familiar with – Oxford Street. Today known as a cultural hub and for its restaurants and shopping, Oxford Street has a fascinating history. As we discovered last week, it was in fact Australia’s oldest highway! As so often happens, as time wore on, and more people began to move about Sydney, Oxford Street became too narrow to service the traffic which used it. In 1907, the first stage of widening the important roadway was completed. This first stage was aimed at improving the intersection of Bourke, Flinders and Oxford Streets, and resulted in the creation of Taylor Square, so named in 1908. Between 1910 and 1914 Oxford Streets northern end, between Liverpool and Bourke Streets, was also widened. In the 1920s, Oxford Street was again a prosperous and well patronised high street. Then, the Great Depression Hit and the once famous and prosperous street began its slide into disrepute. People no longer wanted to live in terraced houses, and so the character of the street changed as the affluent population moved into the suburbs where they were able to do so, and poorer people moved into the old houses. In the 1950s, the street became a haven for migrants and in the 1960s more professionals began to move back into the area. It was also in the 1960s that a gay presence truly began to emerge in the area, and Oxford Streets culture began to change. In 1978 the first Gay and Lesbian Mardi Gras parade was held, and although it was followed by confrontations with police, cemented Oxford Streets central role in Sydney Gay and Lesbian Culture. The image above is a stunning glimpse into the history of one of Sydney’s more famous streets – Oxford Street. Today, known for shopping, restaurants and a vibrant culture, Oxford Street has a long history, and one which is far different to the Oxford Street which we know so well today. Many Sydneysiders and visitors alike are familiar with Oxford Street, yet few realise that the famous roadway is actually probably the oldest highway in Australia! Indeed, Oxford Street was once part of the South Head Road, which connected the settlement of Sydney with the vital signal station at South Head. Indeed, Oxford Street was the main route between the growing settlement of Sydney and the coast. As such an important roadway, it is perhaps no surprise that by the 1870s Oxford Street was one of the most successful and lucrative commercial areas of Sydney. In fact, by the end of the 1880s, Oxford Street was recognised as one of the most prominent ‘High Streets’ in the settlement. Come back next week to discover how Oxford Street changed and evolved in the 20th century to become the vibrant hub we see today. The image above is a beautiful glimpse of the past of George Street, a snapshot of what the street once looked like. It is also an image which captures a George Street which is today long gone. George Street in Sydney is a place all visitors and Sydneysiders alike will be familiar with, being one of the major streets of the famous harbourside city. George Street is at the heart of Sydney, having been the first street to be constructed in the fledgling city when the Colonists arrived. Ever since, George Street has been a hub of activity. Of course, being such an important centre of business and activity in Sydney, it was also once a hive of sign writers. Signs were once hand painted on, or even built into buildings as a way of advertising products or shops. They aimed to be eye catching, so often they were brightly coloured and extremely large, often covering the majority of the visible section of a side wall. Several such signs are visible in the postcard above. Yet these signs, which once were so common, are today increasingly rare. Many buildings, and their signs, have been demolished, and in other cases the signs have been hidden as new buildings have been constructed next to, and covering, the side walls which once were the canvas of sign writers. Today, when a building is demolished and an old sign is temporarily revealed in all its glory, we give the sign the name ‘ghost sign’ – here today and covered once again in short order. Yet ironically, the covering of these signs by modern buildings often preserves the sign, protecting it from weathering, the sun and pollution. Whether any of the signs in the postcard above still exist is questionable, but next time you see a building demolished alongside a heritage building, take a closer look to see if a ghost sign has been revealed! The image above captures a part of Sydney which is vital to European history, and to the story of Sydney as a city. It is a beautiful snapshot showing what, to some, is the heart of our stunning harbour city, yet it is also a place which many Sydneysiders and visitors have probably never visited – Macquarie Place Park. Macquarie Place Park is, as the description of the photo itself suggests, on the corner of Bridge and Loftus Streets in the heart of Sydney. It is named for Macquarie Place, a street which once ran between the Tank Stream Bridge and Kings Wharf, and which is today incorporated into the park itself. The park is a green oasis amongst the bustle of city life, and has always been a rare open space in the busy city, even from the days when the city was just barely beginning. Macquarie Place Park is a triangular shape, and once it was surrounded by the homes and residences not only of the Governor himself, but the civil officers of the colony (including the Judge Advocate, Chaplain and Surveyor). Other buildings surrounding the open space were store buildings and the homes of the most important merchants in the fledgling colony. In these early years the open space was simply left open by chance – nobody had occupied it, though some parts of the land were leased by Sydney residents and personalities. Yet in 1818 the park was formalised by Governor Macquarie as a public space, with the erection of the famous obelisk which measures distances in the colony. Just a year later a sandstone fountain was built. The obelisk is just one of many historic structures and statues which remain in the park, though it is no longer the central feature. Once the obelisk was at the centre of the park, but when Circular Quay was built between 1839 and 1847, several streets had to be extended, and this took up areas which had been previously reserved. Today the obelisk stands at the edge of the park. The image above is an extraordinary glimpse into the past of a street which is familiar to so many of us Sydneysiders – Sussex Street. Being one of the major streets in the CBD of Sydney, it is a street which sees hundreds of pedestrians and vehicles every day, yet the vehicles it sees today are vastly different to those clogging the street in the postcard image. In fact, Sussex Street today is indeed a vastly different place to that shown in the busy image above. Sussex Street is, compared to many others in Sydney, quite small running for just 1.7 kilometres between Hickson Road and Hay Street. Yet its relatively short length is crammed with history, and historic buildings. Sussex Street has long been a centre of activity and business in Sydney, just as it continues to be today. The street runs adjacent to Darling Harbour, and as a result many of the buildings along the street were once, and still are, associated with harbour activities. Hotels, Warehouses, Commercial Stores and even the Hunter River Steamship Navigation Company once lined the street, and today their buildings are often preserved by heritage listings. The image above showcases an extraordinary view of a street all Sydneysiders know, whether they love it or not. Yet few Sydneysiders realise that this street has such a long and fascinating history. Indeed few would realise that this street is the oldest in Australia! George Street was the first street to be built by the colonists when they arrived in Sydney Cove. Yet it was not a carefully planned street, or even truly ‘built’. Early in the history of the colony Governor Phillip began to have public buildings built along a fairly level ledge of land to the Western side of the Cove. Soon enough a rough path was being worn along which people travelled between the buildings being constructed and the Cove itself. This is how George Street began its life. 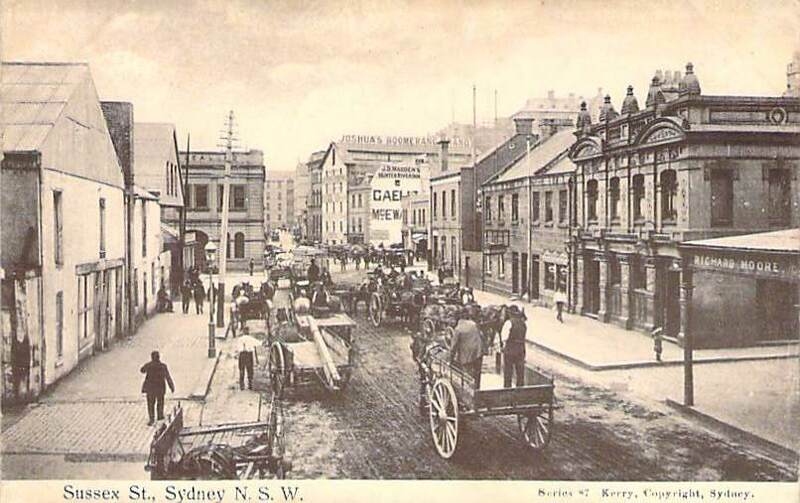 Of course, several of the main streets of Sydney were laid out by the early 1800s. This included George Street itself. By 1803 the military had completed the building of several roads, removing many trees in their way. The stump of one was nine yards around (a little over 8 metres) and took 16 men 6 days to remove. A hole had to be specifically dug in which to roll the stump and it took 90 men to roll it into the hole. This tree was once in the area of George Street.